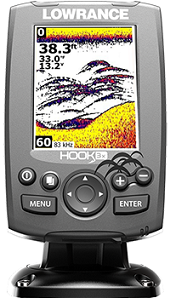 Lowrance exclusive, brilliant, high-resolution, 4-inch, color display. 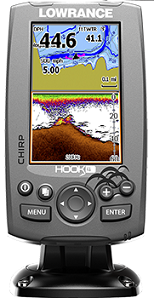 CHIRP Sonar plus DownScan Imaging™ - the power of today’s leading fishfinder technologies combined to provide the best possible view beneath your boat. DownScan Overlay™ technology overlays DownScan Imaging onto CHIRP Sonar. Advanced Signal Processing (ASP) reduces the need to manually adjust settings to see fish, structure and bottom detail more clearly. TrackBack™ to review recorded sonar history including structure, transitions or fish targets, Convenient Page selector menu with quick access to all features using one-thumb operation. Multi-Window Display lets you quickly choose from pre-set page layouts - including a three-panel view.